The brainiacs at Harvard and Stanford are at it again. Just this past month in the Journal of Marketing Research, several Ivy School consumer neuroscience researchers led by Dr. Uma Karmarkar, whom I had the opportunity to interview for this piece, explained to me how putting the price first (called price primacy)—before a user sees the actual product—affects buying behaviors. Mind. Blown. Let’s look at three pricing strategy examples and some specific takeaways from Karmarkar’s findings to see how we can repurpose her research and turn it into actionable solutions. Do I Like It? Is It Worth It? Probably one of the most interesting facets of her research was that price primacy as a standalone variable, regardless of product type, made very little difference in the amount of items that were purchased in her main experiment. In this main experiment, she gave college-aged participants $40 to purchase products that appealed to their demographic, like movies and clothes. During my interview with Karmarkar, she explained that the sequence of this data could indeed have implications for e-commerce pricing strategies. All my research is done using fMRI brain imaging, but many of my these settings are similar to what one experiences shopping online—it’s the same interfacing with a computer. So the benefits of this study could be extremely useful to someone who designs or drives e-comm experiences. She also suggested that price may not matter as much when it comes to luxury items, like the ones she used in her study. Indeed, this is something we can all relate to. 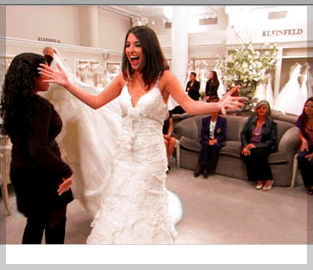 In this scene, we see the joy of finding that perfect, non-essential purchase. She can’t afford it, but she doesn’t care. Classic. To take her findings from the prior studies further, Karmarkar decided to change the products from frivolous, luxury items to more utilitarian products. She and her team hypothesized that folks might care more about price primacy, if, and only if, they were totally necessary items, like batteries or a flashlight or a Britta water filter. The value is integrated because it’s a utilitarian product. But when we showed the price first for these utilitarian products at a slightly discounted rate, they were significantly more likely to buy it. This has important implications for e-commerce product descriptions of on-sale utilitarian products because, in these buying situations, one is seeing the price alongside the item, an image of the item and a description of it. She concluded that it may be worthwhile for marketers to highlight the more functional aspects of a product to show its utilitarianism which could increase the customer’s consideration of the product. One of the most interesting takeaways from Karmarkar’s research was that when businesses show the price first, consumers evaluated the utilitarian product not on how much they liked or disliked it, or even perhaps needed it, but instead judged on the basis of whether the products were simply worth the price. 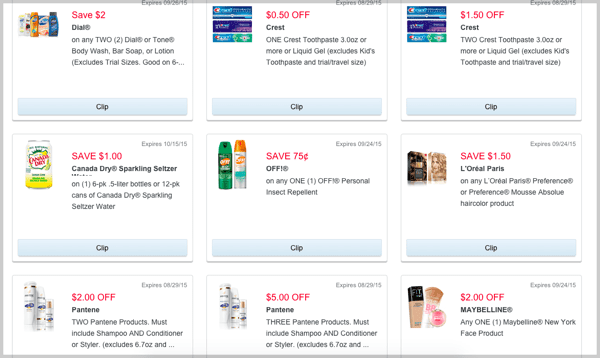 The marketing folks at Walgreens, shown below, have done a nice job of rounding up their most basic, utilitarian products for their coupon-clipper page. As you can see, the savings are first—a key ingredient for purchasing success! And most importantly, which is also in-line with Karmarkar’s findings, the deals are indeed good deals. And they’re quantifiable. The user doesn’t have to do the math, there are no percentages to sift and translate through. You can also see the upselling potential. Notice that if you purchase ONE Crest toothpaste, you receive $0.50 savings, but if you pony-up for TWO of the same kind of toothpaste, you get $1.50 savings. That’s obviously more than double the savings. If firms can offer good or bargain prices for utilitarian products, these finding suggest distinct sales benefits to making the price salient (visible) early on. While we’re tackling the topic of bargains or sales and pricing, let’s take a peek at Home Depot for their strategy on utilitarian product pricing strategy—but for products that are pricey by nature, despite being somewhat necessary for survival. For what it’s worth, being a utilitarian product is subjective. A woman in Guam may not find these products necessary while a woman in Denmark might demand them as 100 percent essential for her livelihood. 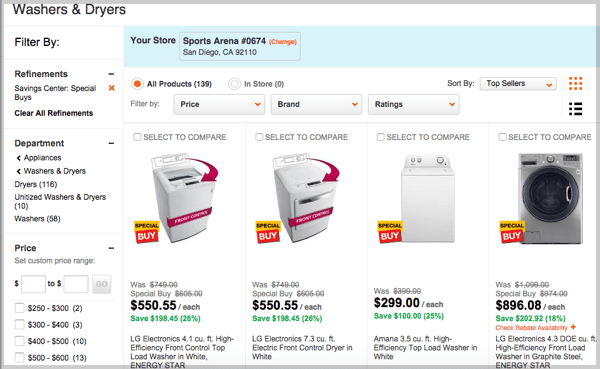 Here are two examples from Home Depot’s site recently that sheds light on this strategy. On the “Washer & Dryer Savings” landing page, the sale price is bigger and bolder; that’s the first thing I noticed. The other thing I noticed was that there was a lot of qualification and ramification for the price tag going on. They show the original price; then the special price; then the bigger, better bargain price; then some math on how much you save exactly dollar-wise and percentage-wise—then, and only then, do they provide a description of the product that highlights its utilitarian use. The pricing strategy is similar to Walgreens, but clearly more aggressive due to the high cost of these products. One can assume that this works for them, I mean, they’re a successful company that’s still running strong. And they clearly think about how their pricing strategies affect buying decisions. 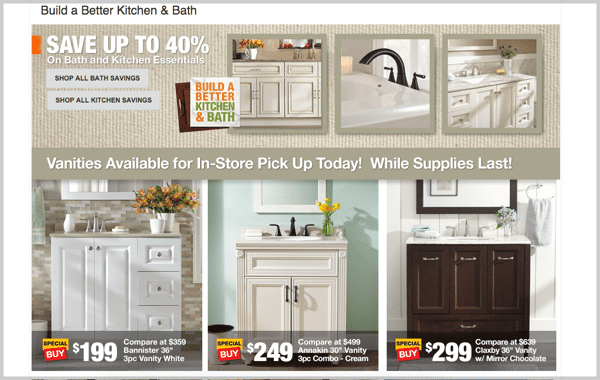 In their “Savings Center” section focused on “Kitchen & Bath Essentials,” one can assume that buying a new vanity is typically not an essential buy for most consumers. That being said, despite trying to set-the-stage with seeding that into consumers’ minds (Essentials), their pricing strategy is less aggressive. And it’s the photos make the product really shine! In a sense, they’re making the really amazing photos sway the consumers, not the price. The price, as well as the sale price, are just icing on the cake. As Karmarkar’s research suggests, when consumers see the price first, it makes them more likely to focus on whether a product is worth its price. For products that people really love and want, it doesn’t matter if price is shown first or the product is shown first, they’re going to buy it no matter what if it’s a good deal. And that might be the best we can do until more research is done to suss out the nuances to pricing categories. What Do You Think Of Decision Science? Do you have any tips on pricing strategy that’s powered by research or data, your own or formal consumer research? Hit me up in the comments section. I want to hear from you, and so do our readers… Now, head out there and be a savvy shopper and score a better bargain. Or maybe, design a better one. 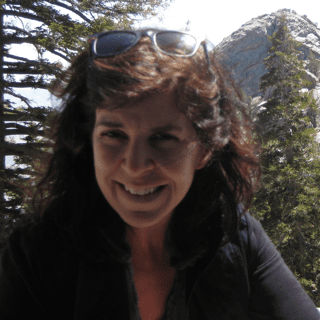 Lauren Ventura has been researching persuasion, reasoning and its effects on users, customers and everyone else since her graduate school days. She currently works at a UX design agency, DigitalTelepathy, as their in-house copywriter, but has also worked exclusively for Petco, Road Runner Sports, Competitor Magazine and many more. Follow her on Twitter. I find this fascinating, because clients and agencies are more reluctant to state the price at all in B2B communication. This is especially true for larger major capital purchases. I’d love to know if this study would hold up in a b2b environment. Home Depot 🙂 good one..!! These are very cool pricing strategies, I think you should try using one of them for your project. As students, I really love science and everything connected with it, I think science will be very important in the future. In free time I like to write essays on various topics, you can see all my essays here https://samples.edusson.com/federalism/ , I recently wrote an essay on federalism, I think you should be interested.